Your stomach is located normally within your abdomen (tummy). A hiatus hernia is a condition where a part of your stomach moves into the chest. Your chest and abdomen are separated by a muscular partition called the diaphragm. Your oesophagus (gullet) passes from your chest into your abdomen through an opening in the diaphragm. This opening in the diaphragm is called the hiatus. Because the stomach moves in to the chest through the hiatus, the condition is called a hiatus hernia. 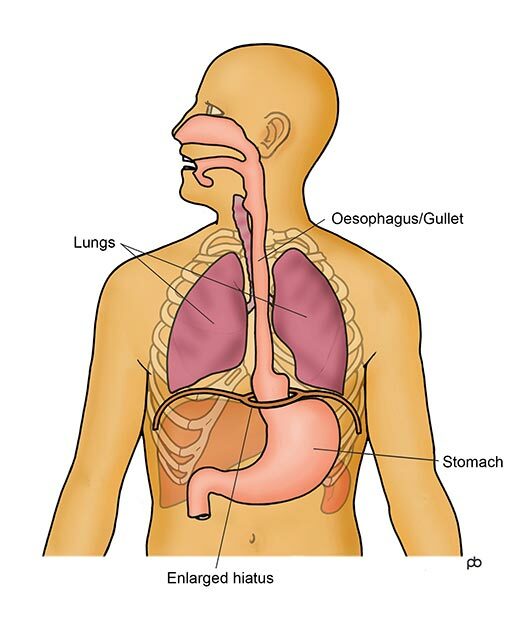 A hiatus hernia is sometimes called a para-oesophageal hernia because the stomach now lies next to the oesophagus. Hiatus hernias can vary in size. In some people, only a small part of the stomach may have moved into the chest. In others, a very large part of the stomach or even the whole stomach may have gone up into the chest. A very large hiatus hernia is called a giant hiatus hernia. There is no definite cause for the formation of a hiatus hernia. What problems can be caused by a hiatus hernia? For some people, hiatus hernias may not cause any symptoms. The hiatus hernia is found incidentally in an x-ray or endoscopy that was done for some other purpose. Such hiatus hernias are said to be asymptomatic. For others, hiatus hernias can be very troublesome. The hernia can damage the natural barrier or sphincter that normally prevents stomach acid from flowing back into the oesophagus. Acid reflux into the oesophagus can cause heartburn, regurgitation of sour fluid into the mouth and various other problems. Also, you can get pain in the chest, difficulty to swallow and vomiting and anaemia because of bleeding. Sometimes, compression of your lungs by a large hiatus hernia can cause difficulty in breathing. What is the treatment for a hiatus hernia? The treatment for a hiatus hernia depends mainly on its size and on the symptoms that it is causing. If the hernia is small and it does not cause any trouble, then no treatment is needed. If a small hernia causes acid reflux, then the treatment is that for acid reflux. No additional, special treatment for the hernia is required. You may consider an operation if acid reflux is not controlled by medication. Other reasons to consider an operation are chest pain, vomiting and breathlessness. Such symptoms are mostly due to the bulk of the hernia itself, and not due to acid reflux. Medication for acid reflux is unlikely to improve these symptoms. An operation should be considered seriously if your hiatus hernia is very large, even if it is not causing much trouble. There is risk that the stomach can twist inside the chest (called volvulus of the stomach) and lose its blood supply. This can lead to conditions called strangulation and necrosis of the stomach, which are life-threatening emergencies. It is very difficult to predict the risk of such complications. Ultimately, a decision has to be made according to your individual circumstances, by balancing the risks of an operation against the risk of future problems. What tests are needed before a hiatus hernia operation? The tests depend on the reason why an operation is being considered. 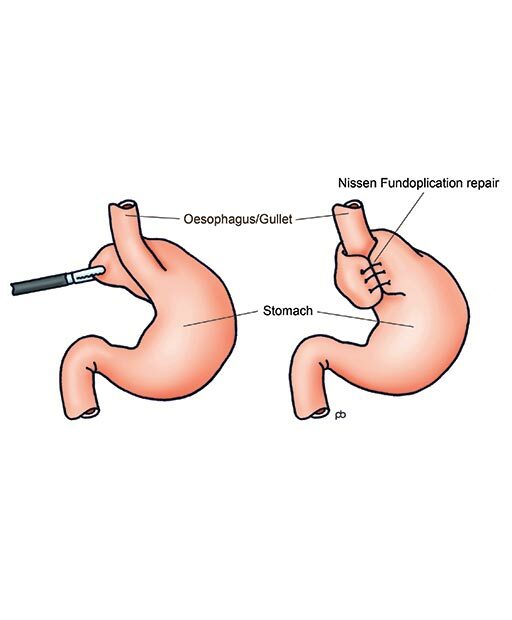 If the hiatus hernia is only small, an operation is done usually because there is troublesome acid reflux. In such cases, the work-up is that for acid reflux surgery. The important tests are endoscopy and oesophageal function studies. If the hiatus hernia is large, then it may not be possible to an endoscopy and oesophageal function studies because of the structural distortion. Here, a barium swallow x-ray gives valuable information. Also, a CT scan of the chest and tummy may be needed. What is a hiatus hernia operation? 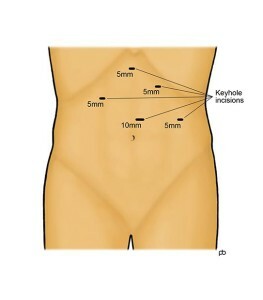 A hiatus hernia operation is done by keyhole surgery through the abdomen (tummy). Although the hernia is in your chest, the operation is best done through your abdomen. 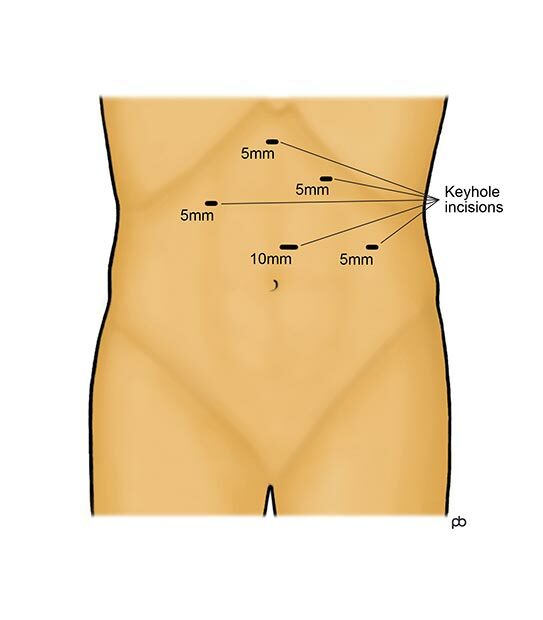 Even very large hiatus hernias can be treated by keyhole surgery. There are two main parts in the operation. The first part is to bring the entire stomach down into the abdomen from the chest. The second part is to prevent the stomach from moving back up in to the chest. 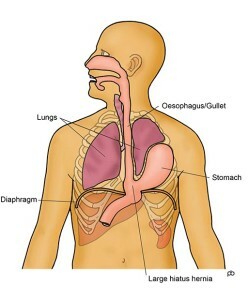 The opening in the diaphragm (called the hiatus) through which the stomach had gone in to the chest has to be tightened. This is done by placing stitches through the muscles on either side of the hiatus. But, the hiatus cannot be closed completely because the oesophagus enters the abdomen through the hiatus. Enough room has to be left around the oesophagus for it to expand during swallowing food. After closing the hiatus, a part of the stomach is wrapped around the oesophagus in order to prevent acid reflux. 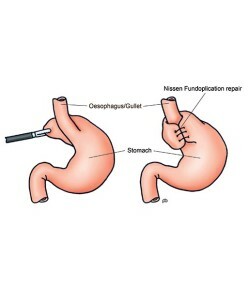 This part of the operation is called a fundoplication. What are the risks of a hiatus hernia operation? The risks of a hiatus hernia operation vary according to the size of the hernia. For a small hiatus hernia, the risks are those for acid reflux surgery. With larger hernias, there is increase in the risks of bleeding, injury to the food-pipe, stomach and vagus nerve, and lung collapse. There is quite a high risk that the hiatus hernia can recur (come back) after an operation. For very large hiatus hernias, about 1 in 3 people will get recurrence. But, the recurrence is usually smaller and less problematic.